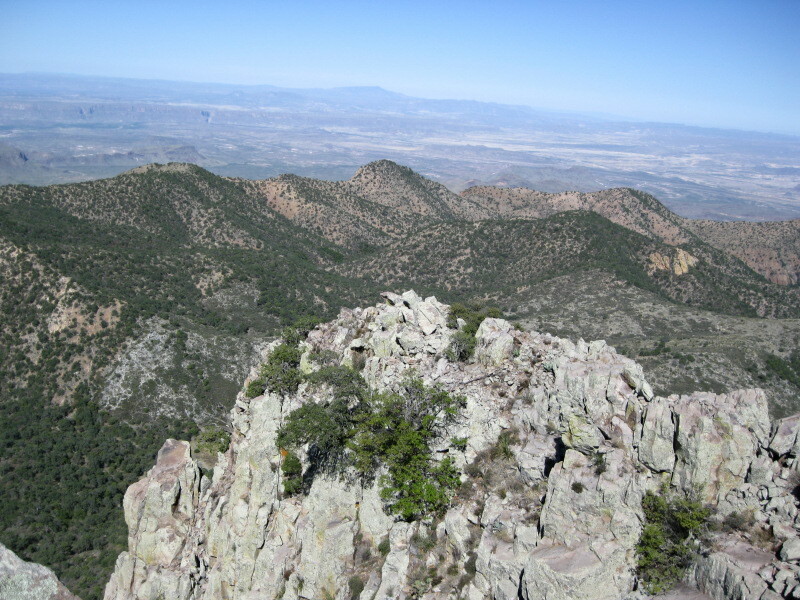 I have been to the summit of Emory Peak many times, in fact it was the first significant mountain that I ever climbed. But for some reason I have rarely taken good notes or photographs. 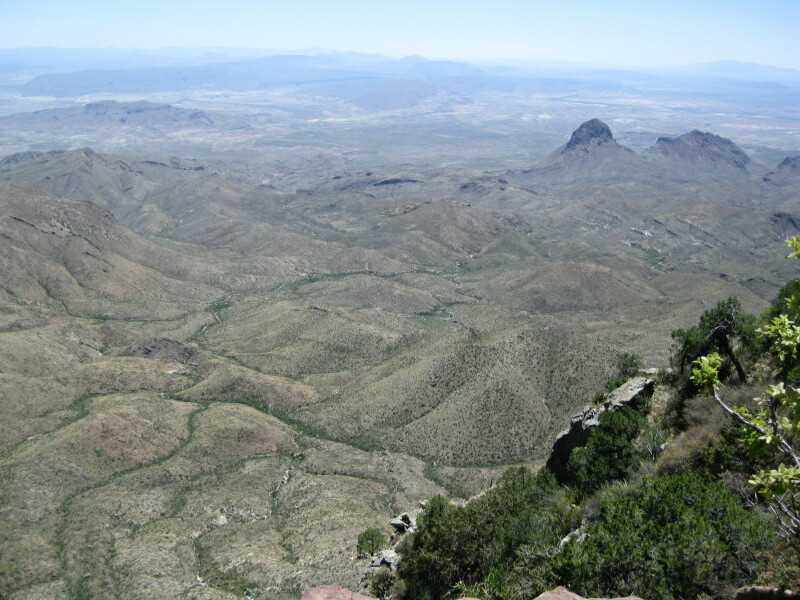 In May 2010, my friends Eric and Debbie, and myself, drove out to Big Bend National Park. 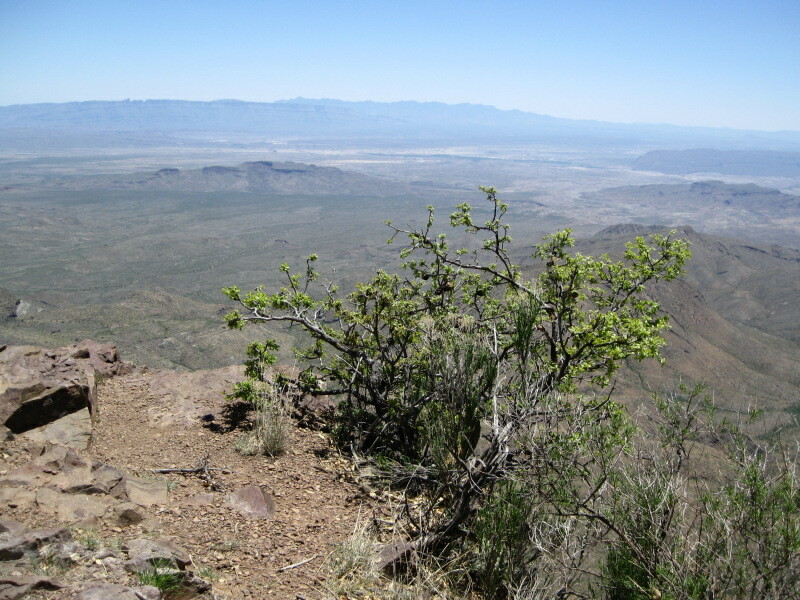 Eric and Debbie were joining a Colima warbler survey, while I was aiming to finally get some photos from the summit. 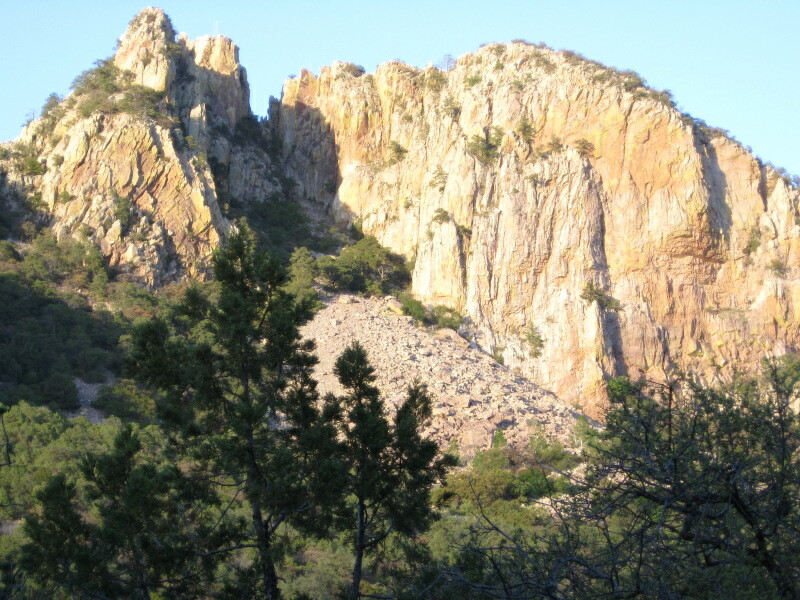 When we got to the Chisos Basin, we checked into our room in the Chisos Mountain Lodge. We had one of the non-air-conditioned rooms, which are actually cooler than the ones with a/c. On the morning of 6 May, we all loaded up overnight backpacks and headed up the Laguna Meadow trail. We got a nice campsite at Laguna Meadow, with views of Emory Peak looming above to the northeast. The next morning, Eric and Debbie headed out for their part in the survey, while I went towards the Emory Peak trail, and on up to the summit, which I had all to myself. Mostly the hike is gradually uphill on a good trail, but there is a small bit of scrambling at the end. Where the trail basically ends, you have two choices for breaching the steep wall you face. The easier way, which is a bit exposed, is towards the right side, at the edge of a notch, but there is also a way directly up the face, a bit to the left of the notch, that is less exposed but a bit harder climbing. After perhaps 15 feet of this, the angle lessens as the rock hopping continues to the summit, decorated with antenna. Near the top, it is interesting to watch the swifts as they fly past at very high speed. 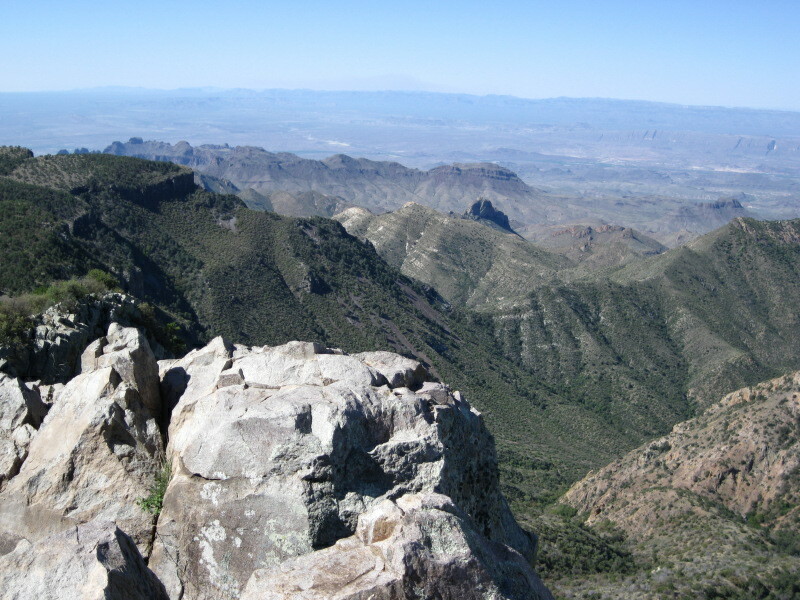 Looking north towards Chisos Basin from the summit of Emory Peak. 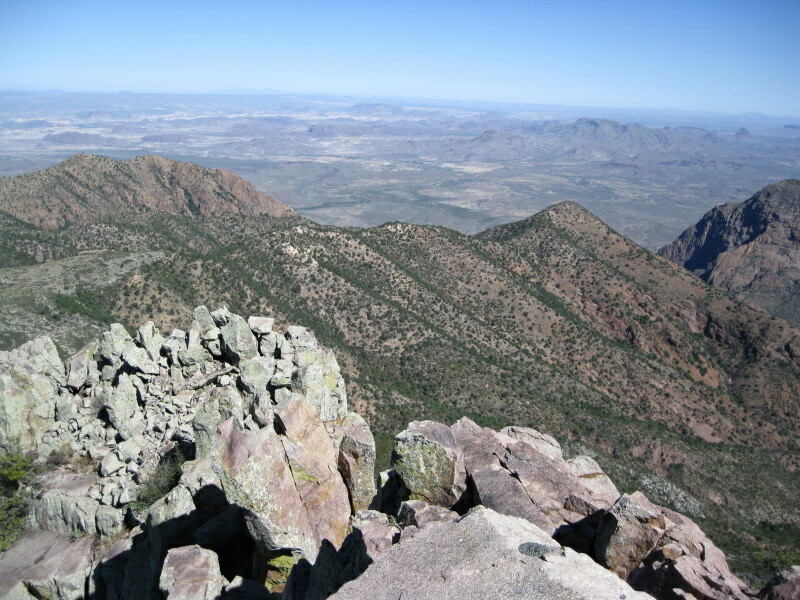 Views from the summit of Emory Peak. 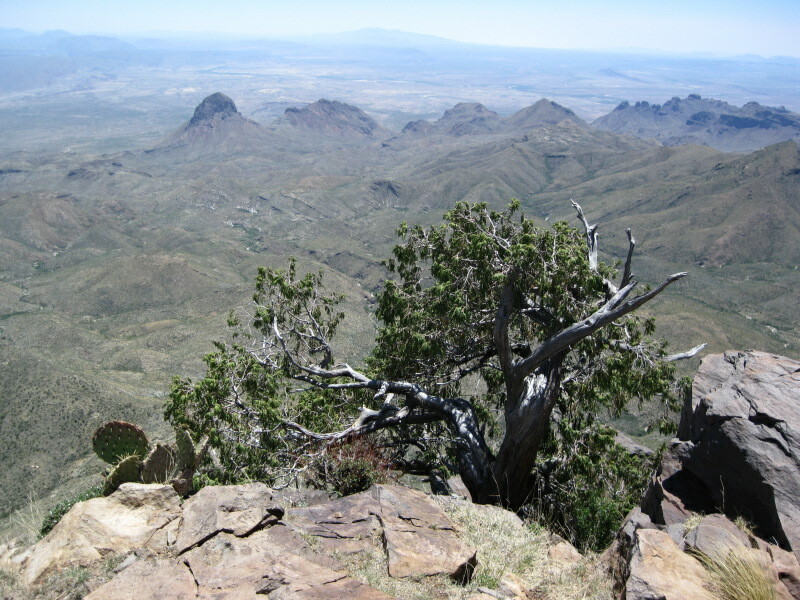 After some time enjoying the view, I decended the Emory Peak trail, and then headed south at the junction of the Boot Spring trail. There were supposedly mountain lions right around this area at this time, but I did not see any. There were also lions near Laguna Meadow, but we did not see any of them, either from our campsite or from the trails. Other people in the bird survey team did get to see the mountain lions, some of them close-up. 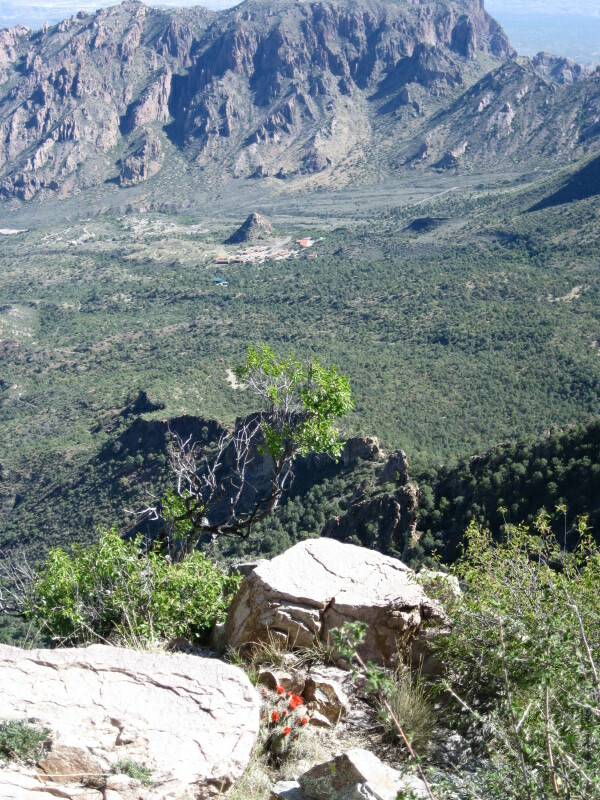 I continued south on the trail to the spectacular South Rim. It was a very sunny and hot day, and so when I ran into some of the survey organizers, who had a couple of bottles of gatorade to hand out, it was a very welcome gift! I drank one bottle right away, then took a nice rest and enjoyed the fantastic views down towards Mexico from the South Rim. Eventually I started back to our campsite, with great views continuing all along the Rim, and handed the other bottle of gatorade to Eric and Debbie. Views from the South Rim. The next morning, with Emory Peak obscured by clouds, we all packed up, and headed back to the Lodge. Eric and Debbie handed in their survey results, while I had nothing I needed to do other than drink some beer. Emory Peak from Laguna Meadow late in the day. 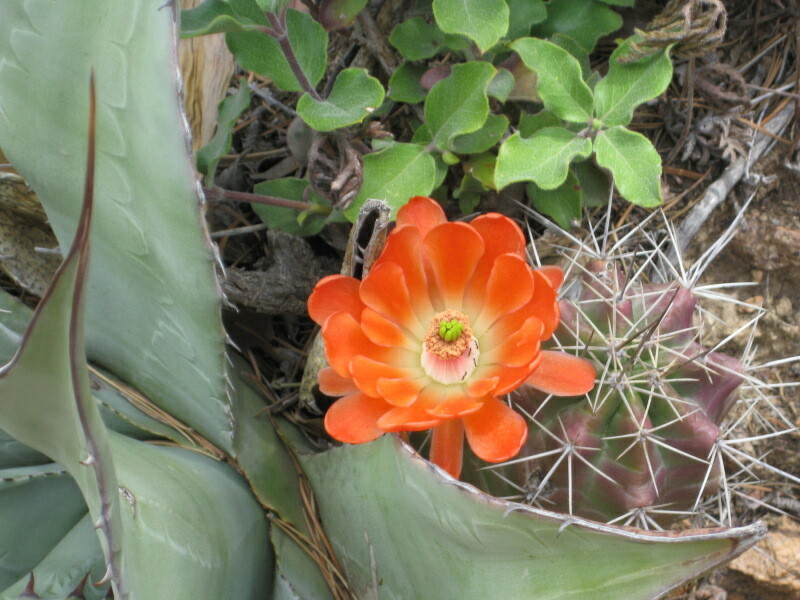 Cactus flower along the trail.